October 29, 2014 by iCepts Technology Group, Inc.
Microsoft Dynamics NAV is a popular Enterprise Resource Planning system to help your business streamline business departments and also provide rich, easy to use reporting. In this second of three series of articles, we will focus on different areas that Microsoft Dynamics NAV can help with better business reporting inside this ERP System. This article will focus on Charts and KPI’s. With easy access to information, Microsoft Dynamics NAV allows your to monitor the status of your organization at a glance with Charts and Key Performance Indicators (KPI) to make it possible for you and your employees to spot trends faster. Microsoft Dynamics NAV ERP provides a large number of built-in charts and graphs rendered in various forms base on role preferences. The user is also provided with the ability to drill down into various levels of detail. Charts are available both in the Windows and Web Client of Microsoft Dynamics NAV on any list place and be customized to display the information the customer is looking for. Microsoft Dynamics NAV also offers advanced visualization capabilities to do visual explorations and intuitive interactions. 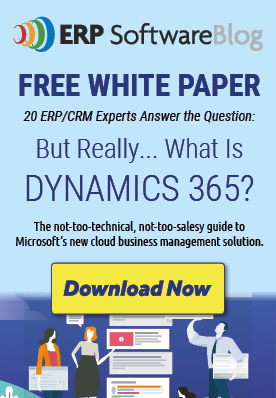 Learn more about Microsoft Dynamics NAV for Better Business Reporting here.